Experts are projecting that 60% of all business will be booked online next year. Are you prepared to get your fair share? It’s not big news that the internet has changed the landscape of travel. A few years ago you would have called your travel agent to help make your travel plans, and that agent would probably have offered you one or maybe two hotel options. Today the choices are seemingly limitless and a bit overwhelming for your potential guests. And overwhelming for hotels too – how much of your marketing budget should you spend on the internet? Where should you spend it? An independent website? Pay per click advertising? What is your best opportunity to capture your fair share of that ever growing population of internet shoppers? Our research has told us there are four tools potential guests use to find their hotels. They only stay at Hilton’s or Best Westerns and the first place they go online is to the brand.com website. A few might go to a search engine and type in Hilton Mclean for example. 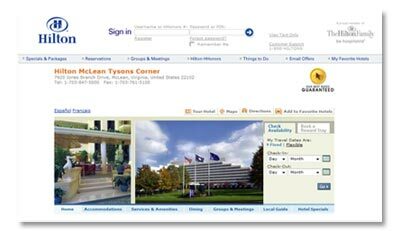 If you are a brand affiliated hotel, your franchise fees are paying for your hotel to show up on those searches. What can you do to make sure you’re getting your fair share? Make sure your brand.com website is up to date with all of your current information about the hotel, things to do in your local area. Pay as much attention to the information (and photos) on your brand website as if you were writing a $20,000 check to produce it, because you probably are. There will always be searchers who are looking for a great deal and they are typically going to third party travel websites such as Priceline.com, Hotwire, etc . . . There comes a time in every hotel’s inventory where they simply need to fill up some rooms. A group fell out at the last minute, or a basketball team lost the semi finals and there were a series of early check outs. This is time to maximize your third party sites participation. Third party travel sites can be an expensive way to get business, so be sure to find out how much you are really paying per reservation as commission, and then decide how much of your fair share of this business you want to go after. Just like there are people who respond to discount coupons, there are people who respond to email offers. It’s a small percent, around 3%, but there are people right now thinking about coming to your area, and if they were to receive a well written email offer describing the benefits of your hotel, a great photo, time sensitive offer and a clear call to action, they might be inclined to make a reservation. 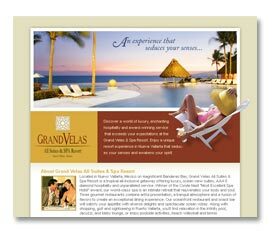 Generating an email campaign is also an inexpensive way to sell a new offer at your hotel to your past customers – new restaurant, new spa opening, newly renovated rooms. Remember the ABC theory – Always Be Collecting. Whenever possible, ask your current guests for their email address, and ask for their permission to add them to your emailing list. You can do this on your website during the reservations process, during check in or check out. Permission based email marketing is simple, inexpensive and can be very effective. The largest percent of online shoppers are using search engines to find a hotel near a certain destination, activity or event. They may be attending a family reunion in Nashville, or planning a girl’s weekend shopping spree at a local outlet mall. Maybe it’s a sales meeting they are attending at the headquarters for local computer company or perhaps a romantic getaway to a beach location. They will go to a search engine of their choice. Google is the first choice for 42% of us, according to ComScore Statistics. 27% use Yahoo, 13.5 use MSN and 8% use AOL . Once there, your potential guest will type in a keyword phrase, something like, “hotels near XYZ Computer headquarters” or “pet friendly hotels in Your City” (if they want to bring their pet to the family reunion!) and they will then find a hotel in the results the search engine returns. But here is the really good news for hoteliers. Most hotels haven’t figured out how to show up high on searches for activities and destinations around their hotels. Most hotels are focusing on being found when someone types in the name of their hotel for a search. So, right now is a great opportunity for you to grab more than your fair share. Don’t believe me? Try it for yourself. Make a list of the top five attractions near your hotel – things like a nearby university, an amusement park, or a popular shopping mall. Go to your favorite search engine and start checking. Type in a keyword phrase like “hotels near XYZ University”, or “pet friendly hotels in ABC City”. What results comes up? Your competitors? You? Probably neither. How many more reservations do you think you would get if your hotel were one of the few that appeared? Within the search engine world, there are two types of search results – paid or sponsored links – usually listed along the right side of the page – or organic results, listed on the main body. In order for you or your competitors to appear when these destinations are typed in, you either have to bid on a keyword to show up under the paid listings, or your website needs to be optimized for those keyword phrases to show up high on the organic side. What does that mean? It means your site needs to have rich, relevant organic content about those destinations on your site, and also, that those destinations have a link from their websites to yours. The rich, relevant content is how search engines determine whether or not to include your hotel in the search results, and the link from the destination is like a reference to the search engines – saying yes, you really are nearby that amusement park or university so give your hotel a high ranking. Capturing your fair share of the online market should be a significant part of your 2008 strategic plan and beyond. The online travel booking landscape will continue to change as social networking and user generated content becomes more common, but before you begin to worry about Web 2.0, make sure you are investing in the optimizing of your independent website and your brand.com site so your potential customers can find you today.